Understand image optimization tips and its process which helps in optimizing the page elements in order to rank higher on image search in Google to promote the ranking of the images in search, as well as optimization of images and image sizes so that they load quicker and increase page speed. Image optimization refers to decreasing the file size of your images as much as possible but also to keep in mind to not sacrifice its quality so that your page loads faster. It also relates to image SEO. This means, getting your product images and/or decorative images to rank on Google as well as other image search engines. Image optimization produces many advantages for your image assets, which includes better user experience, faster page load times, as well as additional ranking opportunities, both within the traditional and image search results. There are several reasons for using image optimization tips. The images that are used by you in your article helps to improve the SEO score which in turn makes your article more search engine friendly also it also plays an enormous role in the page loading speed of your blog. Pinterest which is a photo-sharing site and many sites like them can drive huge amounts of traffic. It helps to in improving your blog’s bounce rate as well as increases the SEO score of your article. If you develop custom images, then you could also be able to acquire backlinks when some other blogs make use of your images in their articles and in return gives you a source/credit link. Photos appear in search engines and as the competition is likely very less in the images section, you will be able to easily get your images to rank higher with correct optimization. The very first point to remember when it comes to image SEO, it’s very crucial to use relevant keywords which will help your webpage rank on search engines. Building descriptive, keyword-rich file names is very vital for image optimization. Along with text on webpages Search engines also crawl the text on your image file names. So give a proper name to your images before uploading them. Next point you need to consider before uploading the image is the size of the image and its dimensions. You should not upload large images to your article because it will lay a massive load on your server which will result in increase in the loading speed. The allowable size of the image you upload must be minimum 200 x 200px so that it gets picked up by the popular social networking sites like Facebook, Twitter and Google+. Tools like TinyPNG and many more exists, that helps you in compressing the images in order to reduce the size. Even after the images are compressed, it won’t affect the image quality much. The image would still look better and it won’t be pixelated or distorted. When a browser is unable to render a particular image properly it displays text alternative to images which are also termed as Alt attributes . They’re also used for web accessibility. Even when the image is rendered, if you hover over it, you will see the alt attribute text (depending on your browser settings). The alt attribute also increases SEO value to your website. Tools like Canva, Pic Monkey, Pixlr help you to give a professional look to your photos. So don’t forget to utilize them as they are very easy to use. Caption refers to the text which is displayed— generally in a gray box — under the image, enlightening what you see in the picture. Even though the words in your article might not be read, chances are great that the text below your image will be read. Captions are valuable because not all images are understood right away, also the function adds context for the image to deliver more context for the search engines to understand (apart from your alt text)., According to Poynter Research, Captions grasp up to 16 percent more readership than text which can prove to be beneficial to readers. Web crawlers are unable to crawl images that are not called out precisely in the webpage source code. So, to let crawlers know about unidentified images, you should address their location in an image sitemap. You can submit the sitemap to Google by using the Search Console. Google has numerous guidelines- Image SEO Help for image publishing, which might help your website rank higher on SERPs. You can also use Google sitemaps in order to give Google additional information regarding the images on your website, which can help Google, find more of your images than it would on its own. If you’re offering valuable and resourceful content and information towards your audience, it’s guaranteed that they might share the content on social media. From Facebook to Twitter, content is shared and links are distributed. Once you have the HTML code set up for Open Graph (OG) as well as Twitter Cards (found in the Yoast plugin in WordPress), you could assure that the image will be displayed on the social platforms each time your link is shared. A Twitter card helps in garnering engagement as well as generating clicks. There are usually three common file types that are used to post images to the web: JPEG, GIF, and PNG. Usually in ecommerce, JPEGs will always be your best bet. They deliver the top most quality for the smallest file size. Don’t ever use GIFs for large product images. The size of the file will be very large also there is no good way to minimize it. You can use GIFs for thumbnails and decorative images only. PNGs are generally a good alternative to both JPEGs as well as GIFS. If by any chance you are forced to get product photos in PNG format, try to use PNG-8 over PNG-24. PNGs outshine as simple decorative images because of their extremely small file size. 4. strengthen your keyword performance. 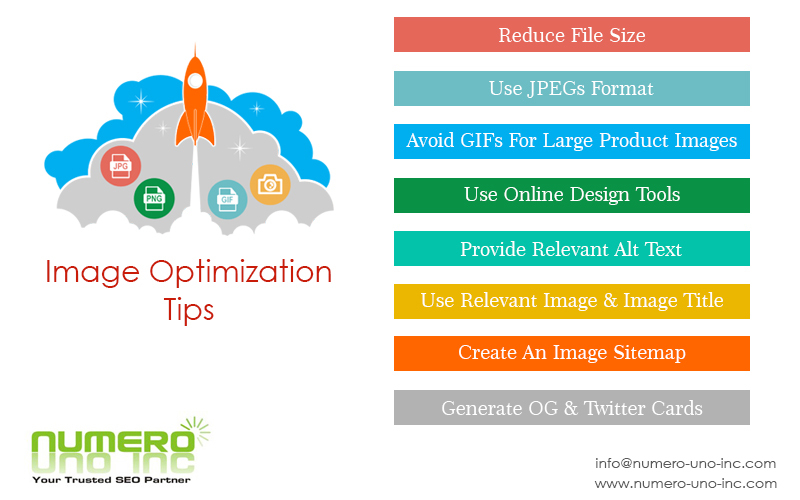 Hope this posts solve your queries regarding Image Optimization and image optimization tips. Do try these tips and let us know how it turned out for you. Dont forget to share this posts with your friends. This entry was posted in Image SEO, SEO and tagged google image search, image optimization tips, image seo. Bookmark the permalink. ← What is Remarketing in Google Adwords? info you’ve got here on this post. I am returning to your site for more soon. are meant to be shared across the net. Glad that you liked the blog article. Hi,Glad that you found it informative . Thank you so much for liking this blog !